Chile Volcano Ash Grounds Flights In Argentina : The Two-Way The photos and videos of what's happening above the volcano range in southern Chile reflect Mother Nature at her showiest. About 3,500 people have been evacuated from the area. And some flights are being grounded in the region. 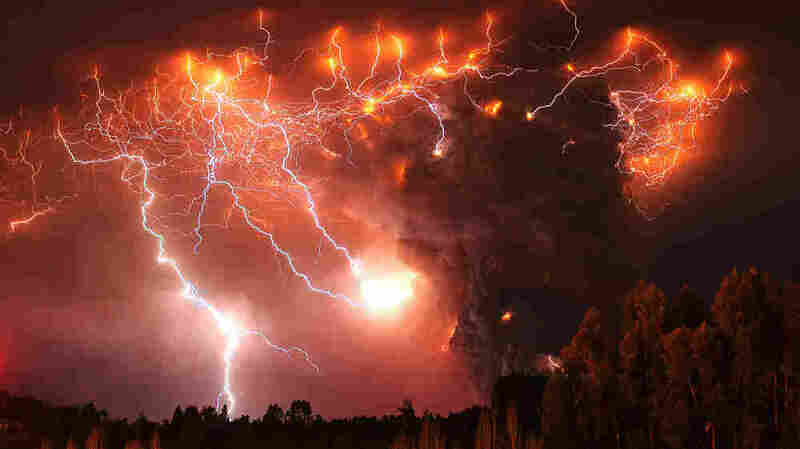 Lightning over the Puyehue volcano, 500 miles south of Santiago, Chile, on Monday. We do like the shows that volcanoes sometimes put on, as regular Two-Way readers know. So we can't resist the photos and videos coming out of Chile, where the Puyehue-Cordon-Caulle volcano range has been erupting in recent days and lightning storms in the clouds of ash have been quite electrifying (pun intended). Russia's RT News has been rolling out some of the best video. Several thousand people have been evacuated from the area. Meanwhile, the BBC reports that the ash has blanketed "the Argentine resort of Bariloche." And The Associated Press says most air travel to and from Argentina has been grounded. According to Dow Jones Newswires, "flights to and from Argentina's busiest airports, Ezeiza and Aeroparque, have been canceled, rerouted or delayed. ... [And] Argentina's flagship carrier Aerolineas Argentinas said in a statement Tuesday that it has ceased all domestic and international flights until further notice. ... The two airports provide domestic and international connections to Argentina's capital Buenos Aires." The MercoPress news agency of Uruguay reports that the ash cloud is expected to reach Buenos Aires today. Meanwhile, CNN reports that "ash piled as high as 30 centimeters (about 1 foot) on highways through Patagonia. Local governments used machinery to clear the roads."